Swatkins ultimate lifetime warranty handmade celtic cup, complete with plinth band and solid hard wood base. The lifetime warranty is against defects in manufacture for life of first ownership. Swatkins ultimate awards are simply the best money can buy and are manufactured for major events worldwide. These trophy cups are handmade by skilled craftsmen and are perfect for a personalised engraving. 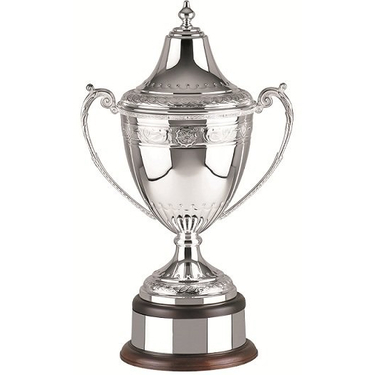 We can add the engraving to the trophy cup itself or to the plinth band surrounding the base. Choose this trophy cup for your presentation event, be it a corporate or sporting event. You will not be disappointed with this Swatkins ultimate celtic cup.